When your mortal enemy swears to protect you, should you trust him? Or run for your life? Endure is a dystopian adventure that tells the story of Justin, an Anemie trying to survive in a world where he faces both extinction and exploitation. When Justin and his little sister encounter Alex, a Vie ordered to kill them, their world turns upside down. Justin must figure out whether Alex is really trying to help them, as he says, or whether he’s just another immortal Vie bent on exterminating Anemies. With so much YA aimed at female audiences, it’s refreshing to read a story told from a male protagonist’s point of view. Justin is a likable character, and the reader has no difficulty understanding his struggles to keep his sister and himself safe in a world gone horribly wrong. It’s easy to sympathize with his fear and agony as he tries to decide who is trustworthy, who is an enemy masquerading as a friend, and what course of action will involve hurting the fewest people close to him. I also like that the author brought an element of romance to the story as Justin befriends Cara, a human girl who is a slave to the Vie. Although I enjoyed the story, I think I would have liked it more if the author had provided enough world building for me to fully understand what is at stake. I struggled to grasp not only the dynamic between the Vie and the Anemies, but who or what they are. Or why, since their blood is a drug to them, the Vie are trying to exterminate the Anemies. Part of the problem might be that the writing tended toward the elaborate, which often stretched out scenes and made the story feel as if it was dragging. Better world building could have made Endure more understandable, and a less-is-more approach to the writing could have improved the flow and made for a more involving read. Overall, though, I think the author has created an interesting world and left the door open for intriguing sequels. 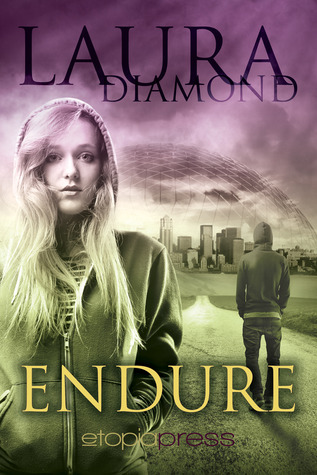 I think any young reader who enjoys dystopian fiction will be interested in Endure.